Last month we reviewed some of the best hard candy this dude has ever had. These things, in glorious grapefruit & lime flavors. I gave it a seriously good try: I searched the web, eBay, I even tried to find more on sites where I didn’t read the language. Have you ever done that? It’s not fun. Nothing. Nada. By all accounts, they were a seasonal item and are long gone. Please understand that I’m not kidding when I say that this bummed me out. The flavors on those candies just shocked me, and I went into candy hoarding OCD mode. But whatever, I’ve moved on. I’ve….yeah, I’ve moved on. Looking forward. OR HAVE I? I knew that Amazon had some Nimm2 varieties, so I decided to see what my options were. While I wasn’t super excited about it, I found the same line of candies, but with orange and lemon flavors widely available-as in, there’s at least 5 different options for buying them. Obviously, they needed to be bought, and now here we are. I’m consumer, I consume. Aint technology great? Even in 2017, most non-American candy is difficult for us Yanks to get, but here we have something seemingly random as hell available on Amazon PRIME no less. PRIME I SAY! If these are even close to as good as the Somer Sauce, then we’re in business. Yep, they check out visually. 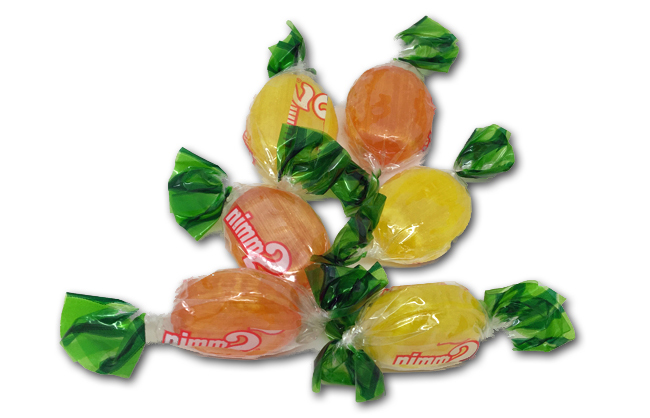 They look exactly the same as others, but in pleasant orangy orange and lemony yellow. Wanna know how they taste? I would if I were you. For why else would you be reading this, unle- ok, I’ll stop. In a word, I’d describe them as “meh”. Again, …..big sigh. Let’s start with the orange. It’s a decent orange, but very standard. Not a lot of bursting fruit flavor here, just a tried & true orange. 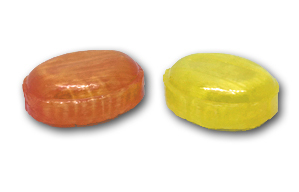 The lemon is pretty much the same-just maybe hinting at tartness, but the overall flavor is basic, plain lemon. 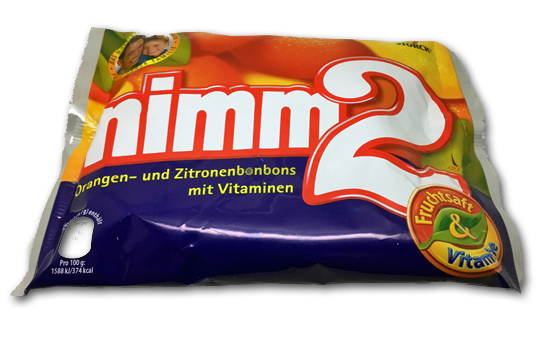 All of these bonbons by Nimm2 have Vitamin C inside with the soft center. But in these 2, the vitamin flavor is much more pronounced, and it kind of interferes with the fruit flavors, which aren’t stellar to begin with. Don’t misunderstand my depression: these are good hards. I’d certainly eat some from a candy bowl. But would I buy them again? No. And when compared to their saucy summer brothers, they don’t hold a candle. That’s the thing- those lime and grapefruit flavors knocked my socks off-and I rarely wear socks. So comparatively, these just fall flat. They’ve left this reviewer cold. It looks like we’re gonna have to wait till summer and just HOPE they make the tastier ones again. These are fine, but they’re nothing special. I mean, Nimm 2? What kind of name is that? I feel like it’s a not-so-good one. Not sure I want to eat candy named after a sequel to another candy. Ahh. Thanks for the science. And adding ‘dipshit’ just makes me want to connect with you more. Give you a big hug. Actually their comment made my day. Albeit the ‘dipshit’ was slightly OTT, but I feel s/he comes from a place of anger, maybe from where all non-lingual assume that everything is made for English speakers.. I wonder where that comes from? !